Nope, that’s just another one of Sarah Palin’s kids. More like Bill Clinton with his coke. Too skinny to be Clinton. Timmay would just rather make fun of a democrat than have someone else make fun of a republican, doesn’t matter if he’s not funny. Isn’t that right Timmayseventytwo. Nothing to do with politics, just looks like something clinton would do. Not anymore; he’s gone veggie or something. 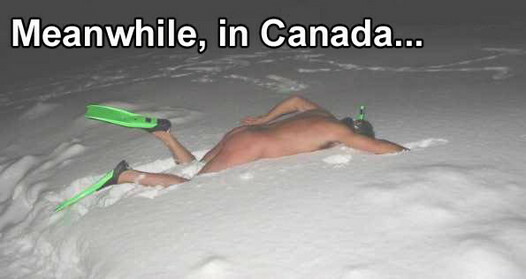 If it was Canada (or Finland), all you’d see is the snorkel. My snorkel would be shrunk to oblivion in that cold weather. Where’s pics of Moutarde doing the backstroke?